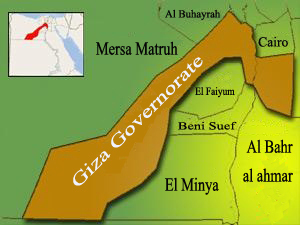 Islamic era Al-Giza continued .to occupy an important position due to its proximity to the Islamic capital of Egypt like (Al Fust at – Al Kata,a –and Cairo). Al-Giza was named like that when the Arabs came and crossed the river Nile. (Giza means crossed). ones now adays.in 1919 the citizen of Al Giza demonistrated against the English colonists in 1919 revolution ,and alot of them ,were murdered in El-shoubk city in El – badrashin ,giza governerate considered the 31 st of March a national day for it. the total Area of it is 1579.75 km2. A sun and the great pyramids and dome of the university parallel to the river Nile. It contains 2 lotus flowers surrounding the pyramids and the dome of the university. 31st of march 1919 the citizens demonstrated against English colonists. The province is administratively divided into 18 cities and 13 countries and neighborhoods. A first class touristic place , it contains the biggest and greatest monuments in the world , the most important of them are the pyramids . the total no. of projects are 148 with total investment cost 16 billion pounds and 64269 workers . · The most important wheat and corn crops, which are characterized by the province.